When drummer Mike Reed recorded The Speed of Change and Proliferation, he didn’t foresee putting both out at the same time. But together, the two discs (on 482 Music) say something important about the legacy of Chicago jazz. The Speed of Change is the second offering from Loose Assembly, Reed’s offbeat quintet featuring altoist Greg Ward, vibraphonist Jason Adasiewicz, cellist Tomeka Reid and bassist Josh Abrams. The mostly original program, Reed explains, is “related to the imprints of early and second-generation AACM, things like [Henry Threadgill’s] Air, Roscoe Mitchell’s sextet,” though the album also includes renditions of “Garvey’s Ghost” by Max Roach and “Tezetaye Antchi Lidj” by Ethiopian vibraphonist Mulatu Astatke. Proliferation, by contrast, is the debut of a new bop-oriented quartet called People, Places & Things, with Reed, Tim Haldeman on tenor, Ward again on alto and Jason Roebke on bass. This is Reed’s homage to the overlooked Chicago hard-bop scene circa 1954-1960, epitomized by figures such as Wilbur Ware, Frank Strozier and Tommy “Madman” Jones. Up to a point, Proliferation is the more “traditional” of the two dates. But tradition is something Reed navigates on his own terms. Proliferation comes from the same world, despite its more straightahead subject matter. The excavating of little-known repertoire, like “Is-it” by Walter Perkins’ MJT+3, “Status Quo” by John Neely and “Be-Ware” and “Pondering” by John Jenkins, makes the album anything but conventional. George Lewis, in his book, notes the “easy, ludic confidence” of the music made during this period, exactly the quality Reed and his colleagues strive to capture. But the inclusion of two Sun Ra pieces (“Planet Earth,” “Saturn”) and three probing Reed originals (“People,” “Places,” “Things”) gives Proliferation a subtly “outside” cast as well. 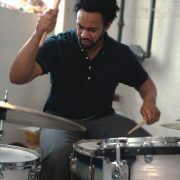 Born in Germany in 1974, Reed settled with his parents in Evanston, Ill., in 1979 and took up drums in his teens. “When I moved back to Chicago after college I really just wanted to play like Philly Joe Jones. I still try to do that, although musically my path has gone quite different.” But again, coexistence is the key. At a Millennium Park concert in late August, Reed expanded the Proliferation quartet to include Jeb Bishop and Julian Priester on trombones, and Art Hoyle and Ira Sullivan on trumpets. He has also kept busy in Mazurek’s Exploding Star Orchestra and a freely improvising trio called TAREAB with Josh Abrams and pianist Craig Taborn. Reed has also nourished a parallel career as a presenter. He is cofounder of the Hungry Brain’s Transmission concert series, founder of the Emerging Improvisers nonprofit, a curatorial committee member of the Chicago Jazz Festival and director of the Pitchfork Music Festival, the sprawling indie-rock event that showcased Public Enemy, Sebadoh and dozens of other buzzworthy acts this July. As widely as Reed’s musical tastes may range, he sees little carry-over between his indie-rock immersion and his jazz pursuits. To paraphrase, Pitchfork is not just an adventure-it’s a job. That’s not to say the skill sets are incompatible. “From my perspective, I think more about the context of things, and how and why they work,” says Reed, who titled his 2005 debut recording In the Context Of. For a presenter, contextual thinking is a requirement. For a bandleader it’s an advantage, an ability to think on multiple levels, or to imagine contexts that may not have existed previously. On “Things,” the closing track of Proliferation, one hears filtered, prerecorded piano fragments enter and exit almost at random, under a tangle of semi-rubato interplay and acidic legato horn lines, with Ward on clarinet. This is Reed’s dedication to Chicago pianists Jodie Christian, John Young and Willie Jones. He played the piano fragments himself, and asked Ward, Haldeman and Roebke to improvise their own as well. Then he cut them up and used them as “ghost samples,” a nod to the first Loose Assembly recording, Last Year’s Ghost (2007).